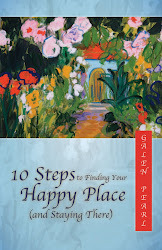 10 Steps to Finding Your Happy Place (and Staying There) is a program to help us develop habits to grow a joyful spirit. Many of us sabotage our happiness by habits that we might not even be aware of. Identifying and changing these habits can build a reservoir of well-being to enhance our happy times and sustain us during challenging times. I went to church today with a heart in pain. I can’t quit thinking about the death of Trayvon Martin on February 26 in Florida. 17 year old Trayvon was walking home from a store with Skittles and iced tea when he was shot and killed by a self-appointed neighborhood watch captain armed with a handgun. Last night I called a friend. She and I are the same age. We both grew up in Memphis. We remember segregated schools and the early years of integration. We remember the day Martin Luther King, Jr, was killed in our city. We remember his dream. But we are different. She is black and I’m white. She grew up with three brothers and has a son and two grandsons. I asked her how her parents prepared her brothers to be young black men in the South, how she prepared her son, and how her daughters have prepared her grandsons. She told me that her brothers were taught to be careful about where they went, not to react if someone said something hurtful, not to stand up for themselves if someone accused them of something, not to fight back. I look at my infant grandson and wonder what his parents will teach him. He is Chinese and African American. What will he need to know to be safe? Who will see him as “other”? Who will fear him or hate him because of his skin color? Who will want to do him harm? When we sang the 23rd Psalm in church this morning, I could not sing the words “I shall not want.” On the contrary, I do want. I want my grandson to be safe. And your grandson. I want all children to be safe. Safe from violence and hatred and poverty and hunger and abuse and fear. Oh yes, I do want. Very much. Being at church this morning felt wrong. I felt like a hypocrite. How could I be here when people, many of whom claim to be people of faith, my faith, do such terrible things to each other? Then the minister stood to invite people to the table of communion, and his words answered my prayer. I wish I could remember them as eloquently as he spoke them, but here is the essence of what he said. related posts: There is No Them; Who is a Terrorist? This is a sad sad tragedy period. Carolyn, I'm so glad you wrote because I never intended to suggest that everyone in the South is a racist, or that everyone outside the South isn't! I am Southern through and through myself, and there is much I treasure about my Southern heritage. What I was trying to convey is that in the South, outside the South, anywhere in the world, when we view people as "suspicious" because they are different, because of race, culture, religion, political affiliation, clothes, whatever, then the potential is there for this kind of tragedy. Your comment made me go back and review my post. I sought to extend the welcome that I heard at church this morning, not to make anyone feel criticized or defensive. This is a very sensitive topic, especially for those of us who claim Southern history as our own, and if I did not handle it in a sensitive manner, my apologies. Carolyn, Glad you wrote back. Sometimes something touches a nerve. That's okay. Just please know that I was not labeling anyone anything. I'm trying to drop labels, not use them. And I was not pointing fingers but rather extending an open hand. A lovely start to a Monday morning. Thanks. Could it happen in Britain, sadly yes. But not as likely, few people here own a gun, thank goodness. Ken, You are right. I've lived and traveled many places in the world. Wherever we see someone as other, as someone to judge or fear, this could happen. Thanks for commenting. Galen, This is beautiful. i too am disheartened by the exclusion in many church, this is not at all the meaning of Christ, who would welcome very one to the table. Racism and other ism need to be eradicated for us to truly find peace, Thank you for putting it out there! So true. How do we eradicate all the things that separate us? I think all of these things are based in fear, our fear. If we can be aware of what opens our hearts (compassion) and what closes them (fear), we can move in the direction of maintaining an open heart towards all people. Thanks for your comment. Galen! I love this! I don't know what else to say! Such wonderful thinking and so sad too. I too anticipate the day when there are no enemies, "When we say, “Come. Sit next to me. Let’s eat together.” "
Lori, All we can do is make room in our own hearts for everyone to come to the table. Thanks for commenting. Galen! This is beautiful and sad! I too anticipate the day when there ARE no enemies, When we say, “Come. Sit next to me. Let’s eat together.” Well well said! Hi again! You probably didn't mean to comment twice, but I liked both comments and couldn't choose! Thanks twice over! This is a very powerful post Galen Pearl, one that talked to me a lot, seeing my husband always trying to please, seeing him being judge with every step he takes, It talks to me for our children to come. The message you share from the minister speech is full of hope, respect and truth. I keep praying this day will come. I still believe it's possible. Thanks you dear, have a lovely day! Marie, My heart goes out to you and your husband. And yes, I believe that day will come. It is inevitable. In fact, it's already here. Always. We just block our awareness of it. Thanks for your comment. Thank you for these wonderful words of wisdom and truth! We first have to believe and then we can see. Nancy, It is an amazing church! I really belong to it because I love this group of folks. I don't really care what denomination it is. I'm going to look up that verse. Thanks for commenting. Three more churches in our part of the state just broke off over the Open and Affirming commitment....as part of Holy Week - it made me so sad...My own denomination has been Open and Affirming for at least 25 years...and as a woman they were welcoming? I just am confused about why all this backlash against women and color and orientation...One of my children is Korean/Japanese Heritage with a cleft palate you can not believe all the comments I have had and worries about protecting and hoping...the worry seems more intense these days and leaves me wanting too..
Patricia, We are on the same trace today indeed. So puzzling about why a church would have rules that would exclude anyone. And I know your hurt for your child. Thanks for your comment. I have tears in my eyes. I remember reading that Psalm at school - I studied in Christian schools throughout. This Psalm particularly stuck in my head as a prayer. I too dream of a day when there will be no mental boundaries and people will see each other as equals, not less, nor better. One world. One religion - that of being human. The minister's words are powerful indeed. But even more powerful is the way you've expressed this post. I can feel the compassion. Hugs, Galen. Vidya, I have always loved that Psalm, too, and often say it to myself in times of trouble. The line about the table in front of enemies, though, has always bothered me, unless I envision it as a way to shift the enemies to friends and invite them to the table. The reaction to this tragic killing in Florida shows that there is such a need for open dialogue, not a dialogue about what did or didn't happen that night, but about the ways that fear blocks our recognition of each other as brothers and sisters. Thanks for commenting. Galen thank you for the extreme kindness and inclusiveness of your post. I keep getting lots of negative, racism-denying white folks interacting on Facebook with me. The Black Americans I know, all feel this was connected (at least in-part) to race. I feel sure it was, too. May God Bless You, and Keep You... And your beautiful, diverse-heritage grandson! Lisa, The different perspectives on this tragedy, to me, show more than anything that different groups, for lack of a better word, interpret events through different lenses. These lenses are shaped by our experiences. My friend and I, for example, grew up in the Memphis, but the city she grew up in was not the "same" as the city I grew up in. The question for me is not so much who is right, but rather how can we listen to each other with an open heart? How can we look past our fear and defensiveness to honor each other with humility and compassion? Thanks for your kind words. I find it a very hopeful sign for our future that my 31 year old daughter cannot fathom the hate and discrimination of the 60's and everything that people did to other people. When she sees a movie or documentary about that period of American life she finds it hard to believe hate was so blatant and open. Obviously, the event in Florida is just a very public and extreme example of what goes on everyday all over the country: hate generated by the color of someone's skin or a particular belief system. Heavens, there are people who hate with the same unreasonable passion based simply on political beliefs. All of us need to read and believe the message in the 23rd Psalm. Bob, Your daughter's view is a hopeful sign indeed. Yet, as you say, hate, which is always based in fear, takes many forms. The current political climate is certainly an example of that. This psalm assures us that we need fear no evil, for we are never alone. Thanks for your comment. I'm so sorry for your pain and fear for your grandson. It's naturally to want to protect those close to us. Yet, indeed, as you suggests, the world will be different when we wish to protect everyone. You have a beautiful heart! Sandra, I think you said it. When we see everyone as "close to us," the world will be different indeed. Thanks for commenting. ah, now I can reread everything and as I said… I really knew what you meant. I have recently had to defend 'us' primarily because of Rick Perry… ~!^ ... Texas, in particular gets a really bad rap from its politics. The only thing I want to add to your beautiful and heart felt post is gun control. This is a hot topic always in politics. I'm not for taking away guns … I'm for making it as difficult as possible to own one. There is absolutely no need to be able to go to Walmart and walk out with a gun… outrageous. The gun shows and so forth… outrageous. Absolutely ... until we overcome our fears of each others' race and/or religion ... we will never be free and will walk in fear... well, some of us. Your church sounds wonderful. If Zimmerman had done what the 911 dispatcher had asked … IF he had not wanted to be a hero …. IF he had not been allowed to carry a weapon … IF he had recognized the young man as someone who hadn't been in the neighborhood and was concerned and just kept his eyeballs peeled for mischief --- that's the job of a neighborhood crime watch person…. then call the police ... not play hotshot hero. Ah… life in the United States. bottom line? we need better gun control. of course, it won't keep guns out of the criminals' hands.. but we don't have to make it so easy for them either. How many more shootings is it going to take before we legislate better gun control. I've said many times… ok ok .. own yer damn guns but you can't buy bullets until you sign for them and state what your purpose is for said bullets. Carolyn, Thanks for coming back and sharing more of your thoughts. As I wrote in a related post, as long as we think in terms of us and them, no matter who "us" is and who "them" is, then fear will remain a separating force. Whether we have guns or not, fear will manifest in the harm we do to ourselves and to each other. We can talk in terms of racism, or in terms of gun control, or whatever, but as long as we mistakenly perceive ourselves as separate beings, we will live in fear. Thanks for engaging in this conversation. Blessings to you and to all. Galen, this made me cry. My favorite Psalm and such a sad post of truth. Just today my son asked what West Side Story was saying about people with "tanned skin" - the phrase he used. he had watched a clip in music. Being 10 he did not get the meaning. I explained the whole skin color/culture aspect of the musical and he was horrified - literally, you should have seen the look on his face, that people would hate so strongly based on culture or color. I am very proud that he saw no reason to hate someone but also questioned how sheltered he was. Perhaps it is time for him to understand more and be able to be more active in making sure racism ends. Katy, What a sweet story about your son. I laughed about the "tanned skin" observation. I have a biracial son, white and African American, who is also autistic. The autism has overshadowed any racial issues for him, and he does not identify people in typical racial terms. He calls himself and other African Americans "brown." Autism is a great equalizer in racial terms. James has never seen himself or anyone else as "other" because of skin color. He sees skin color as a variable in the same way hair or eye color is. The other side of that, though, is that he misses out on the richness and diversity of various racial cultures. Thanks for commenting. One of the interesting things I observed about growing up in Singapore is that I never really saw people by the colour of their skin. I saw them through the colour of their hearts, but never by the colour of their skin. That I am able to do this is due largely to the social integration here in this country. It also goes to show how much of our perception is due to outside influence, how society conditions us to think and what we pick up along the way. I always marvel at how people can go about their lives here without worry. It doesn't matter what colour they are. Sure, there are jerks who believe they are superior. There is some religious and racial tensions due to the events around the world. But these are the minority. For the large part there is peace and harmony. But this peace and harmony did not happen on its own. Otherwise there will be peace everywhere in this world. Whether there is peace or tension, it is largely due to the choices people make. In this case, for Singapore, it was the policy pursued by the government. It saddens me to see that people treat others as lesser because of skin colour. It is sad to see people thinking they are superior because of skin colour or race. Such perceptions have caused the holoucaust when a madman came to power. As for the practical matter of what we can do to manage, it again boils down to choices and actions. Unless we are aware of the essence of the situations we are in, unless we make the best choices with foresight and awareness, it is hard to maintain good fortune in our lives. We will find ourselves reacting instead or pre-empting events. And when we react, we have less time to respond wisely or to make the best choices. If peace and harmony is to prevail, everyone has to make better choices. Only then can future generations feel safe no matter who they are. Thank you for sharing this lovely article! Irving, What a fascinating perspective from a country that seems to have accomplished what others have not. Can you say a bit more about the government policy that you credit with such harmony in the midst of diversity? Thanks for commenting. Well you would probably have to look at the founding of Singapore. When we broke away from Malaysia, we had very little to work with. We had no natural resources. The only thing we had going for us was our strategic position and the people. Our founder Lee Kuan Yew, being the pragmatic Virgo that he was, realized that all of us had to work together to succeed. It was probably a combination of circumstances and leadership that shaped our views today. Broadly speaking what the leader or the government decides will have an impact on the common people for generations to come. Such is the power that rulers wield whether they are fully aware of the implications or not. More people should take a look at Singapore's success with a multiracial, multicultural society. There is much here for us to learn. Sandra, I wonder what will happen in the generations to come. I have been to a Catholic church and to a Mormon church, both of which restricted communion to those eligible. I know--I can't quite see Jesus checking credentials! I'll be right over to read your post. Thanks for commenting. Dear dear Galen - sadly this could be true in any part of the world. We are so threatened by what's 'different'. It seems to me that the more educated and 'progressive' we have become, the more we spot these differences and are ready to attack someone for them. India used to be such a melting pot of religions and cultures, but sadly that has changed in the last few years. I, like you, want...Let us pray for that day to come. Corinne, I have been many places in the world, and I can see how "other-ness" can show up anywhere. I appreciate your perspective on how India used to be. What do you think caused it to change? Thanks for commenting. Galen - The way India was divided in to two countries (India and Pakistan) and all the terrible things that followed this partition caused a lot of ill-feeling between the Hindus and the Muslims. I'm sad to say that this was fanned by the British. So many people got displaced, lost family and property and the scars of this remained. Also I think, world over, their is move for people of the same religious or ethnic background to become more inclusive, don't you think? Being a southerner I get what you are saying. It's sad that we label people and try to make others feel inferior, merely bc of our skin color. One day in heaven we will all be the same, we will all be colorblind. Alecia, This does seem to be a topic of particular sensitivity for us Southerners, but as other commenters have noted, it happens all over the world. I appreciate your sentiment. I would add that we are the same right now, at our deepest level. The differences we exhibit could be a source of interest and sharing rather than judgment and fear. Thanks for commenting. I do pray for safety for all of our children...all of them. We have seen hatred and prejudice in so many different countries. I know it breaks God's heart to see this. Alida, Yes, I'm sure it does. Thank you for commenting. ????? This is why I don't watch the news. EVER! We do not know the whole story. We will never know what really happened. It is being filtered to us, as all media news is. But what in the world does this have to do with being a southerner? Dealing with perceived injustice, violence and growing out of a victim based mindset is a human issue. It has nothing to do with race or ethnicity it a part of our collective. Nicole, True, we only know what we hear through the media. I trust that the investigation will sort out the facts of what happened in this particular incident. However, as you say, the bigger issue is a mindset that sees victims and fear. Thanks for your comment. Oh, this is so beautiful. There are so many things we do want, and this is one that I think many of us share. So much has improved, but we still have a long way to go. Praying with you that someday the prejudice will end, and we will all sit together. Someday, I think we'll get there . . . probably toward the end of Revelation, though I truly wish it would happen sooner. Mary, It can happen in our individual hearts right this instant. Thanks for your comment. Galen Pearl...I linked to this post on the Am I Tolerant segment. And we surely do all want the same thing; for our children and grandchildren to be safe. Your post's title caught my attention and brought me here from OYHT. So I was surprised it turned out to be about racism! Also that no one commented on what "want" means in Psalm 23. Interesting because Husband just told me yesterday how he misunderstood that verse when he was a kid. He thought it meant "I don't want Him to be my shepherd"! and struggled with that for years. My first husband (long deceased) also told once how he thought it meant he shouldn't want (meaning desire) anything, and struggled with that! What brought up the verse's misunderstanding yesterday was how many words in the KJV Bible, and in other old writings, have changed meaning drastically in 400 years. "Want" was the first that came to our minds! "Want" back then meant "lack, be in need of." The idea of Ps 23:1 is Because the Lord is my shepherd, I shall not lack anything I need. And the rest of the Psalm talks more about this. There is so much injustice on the earth, and maybe one of the worst things about it is how it grabs our focus away from the Lord. We get so focused on people that we forget all about Him and all that He has said in His word. One thing it says clearly is that He is a God of justice, that He hates all earthly injustice (especially on the part of people who claim to be His children) and that one day He will right all earthly injustices. What a beautiful hope to look forward to in this ugly, God-needy world! Sylvia, Thank you so much for taking the time to comment so thoughtfully. The different interpretations of "want" are enlightening. In my own mind, I have usually understood that verse to mean that with the Lord as my shepherd, I need not worry about anything. I have no lack, I need desire nothing. All my needs are taken care of. I'm safe and cared for. I only need to follow Him in faith. I used that verse for this post, because my heart was so pained by this event. Not because I think I know exactly what happened, but because to me it symbolized the us/them thinking that separates us from each other. Not just in the event itself but also in the divisive reactions to it. Again, thank you for stopping by. Your comment is valuable and valued. Comment moderation is enabled to block spam, so please excuse the brief delay until your comment appears on the blog. 1. Give yourself permission to be happy. 2. Decide if you want to be right or happy. 3. Give up the delusion of control. 5. Make haste to be kind. 9. Develop an attitude of gratitude. Send Galen Pearl an email! I am a Southern girl transplanted to the Pacific Northwest. I have 5 kids, 2 grandchildren, 6 birds, and a dog. My new blog, No Way Cafe, is about how the principle of wu wei, or non-action, can manifest in our lives, bringing peace and joy to our spirits. This blog is inspired from many sources, including the Tao Te Ching and my martial arts practice. My first blog was about 10 habits that transformed my life from one grounded in fear to one grounded in joy. I no longer add new material to this blog but it's still online. Galen Pearl is my pen name.